Cobalt, the FX post-trade processing network based on shared infrastructure and high performance technology, has secured a strategic investment from Singapore Exchange (SGX), which operates Asia’s largest, most diverse and fastest growing FX exchange. SGX’s investment will support the continued expansion of Cobalt’s footprint into the FX space, further accelerating technology development and build out of the team. Cobalt’s unique solution leverages highly optimised technology alongside an in-house immutability service based on distributed ledger technology (DLT) to deliver a shared back and middle office infrastructure that is scalable, secure and fast. The platform takes a fresh approach to financial infrastructure and has been developed to replace the dated middle and back office systems of today, which can be disorderly, inefficient, risk-laden and costly. To keep up to date with news from Chatsworth Communications follow us on Twitter & LinkedIn. The cross-border payments industry has seen a revolution in speed and transparency over the past decade or so. A generation of new companies are eyeing the role of incumbents and exploring new technologies such as blockchain to transform existing processes. However, examples of genuine innovation are beginning to emerge amongst both new providers and incumbents. Once such example is the global banking messaging giant SWIFT, which revealed that users of its Global Payments Initiative (GPI) service, are receiving payments within minutes, and even seconds. Nearly 50% of SWIFT gpi payments are credited to end beneficiaries within 30 minutes, and almost 100% of payments within 24 hours. 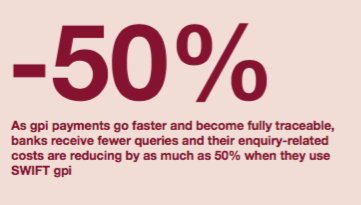 With all payments fully traceable, there have been fewer enquiry-related queries, reducing costs for banks by as much as 50%. SWIFT has set the international standard for cross-border payments for over four decades, and this week’s announcement directly addresses the perception that its payments are slow and cannot keep up with the new upstarts. To the contrary, SWIFT gpi continues to gain significant traction; traffic already accounts for nearly 10% of total SWIFT cross-border payments, and over USD 100 billion is being transacted every day by 150 banks across more than 220 international corridors. SWIFT has made it clear that the service currently does not incorporate blockchain technology – making the speed of payments ever-more impressive. Yet, it’s important to note that blockchain is not a panacea; any payment service must offer speed, transparency, industry-wide connectivity and have appropriate regulatory oversight. SWIFT gpi incorporates all of these without incurring huge costs for banks and their customers. It is clear that gpi service has transformed the way cross-border payments are sent and received, and further enhancements appear to be in the pipeline for 2018. As more banks use the service and integrate it with their corporate offerings throughout 2018, the number of corporates will continue to grow rapidly. With SWIFT already playing a key role in delivering the New Payments Platform in Australia and introducing real-time payments to Europe later this year, it seems 2018 is shaping up to be a key year for the cooperative and its members. This year there were no big headline tech launches to speak of which is unusual for an event which in years gone by saw the launch of Twitter and Foursquare, to take but two. But this year, the tone and content was quite different. The changing political landscape loomed large, chiefly with the ‘tech under Trump’ work stream but also with keynote speeches from Joe Biden and Corey Booker. For 2017, the recurring theme was on a pervasive lack of trust and transparency between individuals and organisations, as well as between society and its governments. Various barometers of sentiment reveal that we are at a historical low for trust in institutions such as banks and the media. Four panels and presentations focused on the technology variously known as Blockchain or Distributed Ledger and how it can be applied to hardwire and build trust into our systems and interactions. Discussions ranged from how this tech enables individual contribution, makes it easy to collaborate, decentralises power and creates hope for increasing equality. There were hands-on workshops and introductions to some of the protocols, coding and design challenges in creating distributed data structures. As a recap on ‘Blockchain’, it is effectively a record of assets, or any other kind of content, that is shared, replicated and encrypted so it becomes a verified and immutable source of truth. The blocks can’t be modified, but can be viewed, meaning a huge benefit lies in the added trust and transparency that provides. Dr Tomicah Tillemann, of New America’s Bretton Woods II program is working with his team to apply the principles of blockchain to the US land registry system. Speaking at SxSW he commented: “Institutions right now provide the facts at the foundation of our reality. I know there’s a land registry somewhere that says I own my house. I swipe my card because I know the bank will transfer the right money for me. As soon as people lose confidence, those systems start to break down really quickly. With over 90% of goods in global trade carried by the ocean shipping industry each year, there are clear benefits to enhancing transparency and sharing information. From the exchange of money between two parties, to documenting how goods move through a supply chain, and the making of contractual agreements, there are significant savings to be had in terms of cost and time as well as the potential to reduce risk and increase trust. Over 1,300 fintech professionals arrived at Tobacco Dock in East London yesterday morning for SWIFT’s annual Business Forum London conference, which has become the must-attend yearly event for this rapidly growing industry. After a quick coffee in the sunlight-filled atrium of the impressive nineteenth Century tobacco warehouse, the day’s proceedings kicked off with a panel debate based around the event’s theme for 2016: building the future. SWIFT’s CEO, Gottfried Leibbrandt took to the stage along with Digital Asset Holdings’ Blythe Masters, RBS’s Director of Payments Marion King and Andrew Hauser, Executive Director of Banking, Payments and Financial Resilience at the Bank of England. The themes that emerged in this session set the tone for the day, with one of the reoccurring debates focusing around how banks and other incumbent service providers could co-exist with fintech startups seeking to ‘disrupt’ and innovate in areas such as payments. SWIFT’s inspired agenda ensured that almost every panel debate featured representatives from both sides of the fence, and it was fascinating to see the level of collaboration between some of the giants of the banking world and young, agile startups, with both sides bringing their inherent unique strengths to the table. Of course the most popular theme of the day was blockchain, with seemingly every panel discussing how distributed ledger technology could be used to revolutionise their particular areas of the industry, and the R3 initiative being singled out as leading the charge in light of its launch of the Corda platform, which Barclays had tested in front of a live audience just a few days earlier. There was a distinct air of excitement and positivity in all the conversations we had and overheard at the event yesterday, and we left with a sense that, even though we are only four months in, 2016 could usher in some of the most significant developments the fintech space has seen for a very long time. Chatsworth client R3 CEV has successfully trialed five distinct blockchain technologies in parallel in the first test of its kind, as reported this morning by Wall Street Journal, Forbes and Reuters. The trial represented the trading of fixed income assets between 40 of the world’s largest banks across the blockchains, using multiple cloud technology providers within R3’s Global Collaborative Lab. This marked an unprecedented scale of institutional collaboration between the financial and technology communities exploring how distributed ledgers can be applied to global financial markets. The banks connected to R3-managed private distributed ledger technologies built by Chain, Eris Industries, Ethereum, IBM and Intel. They evaluated the strengths and weaknesses of each technology by running smart contracts that were programmed to faciliate issuance, secondary trading and redemption of commercial paper, a short-term fixed income security typically issued by corporations to raise funding. The R3 member banks involved in this trial included Banco Santander, Bank of America, Barclays, BBVA, BMO Financial Group, BNP Paribas, BNY Mellon, CIBC, Commonwealth Bank of Australia, Citi, Commerzbank, Credit Suisse, Danske Bank, Deutsche Bank, J.P. Morgan, Goldman Sachs, HSBC, ING Bank, Intesa Sanpaolo, Macquarie Bank, Mitsubishi UFJ Financial Group, Mizuho Financial Group, Morgan Stanley, National Australia Bank, Natixis, Nordea, Northern Trust, OP Financial Group, Scotiabank, State Street, Royal Bank of Canada, Royal Bank of Scotland, SEB, Societe Generale, Toronto-Dominion Bank, UBS, UniCredit, U.S. Bank, Wells Fargo and Westpac Banking Corporation. Further exciting developments are set for the months ahead, as R3 continues to work with the banks in its Global Collaborative Lab to test and develop applications based on distributed ledger technology for the financial services industry. The Lab has quickly become a center of gravity for collaborative applied blockchain efforts in the financial services and distributed ledger technology industries.